Renewable energy yieldco Pattern Energy Group (NASDAQ:PEGI) catches a lot of income and dividend investors' attention with its eye-popping yield, which is pushing nearly 8% at recent prices. 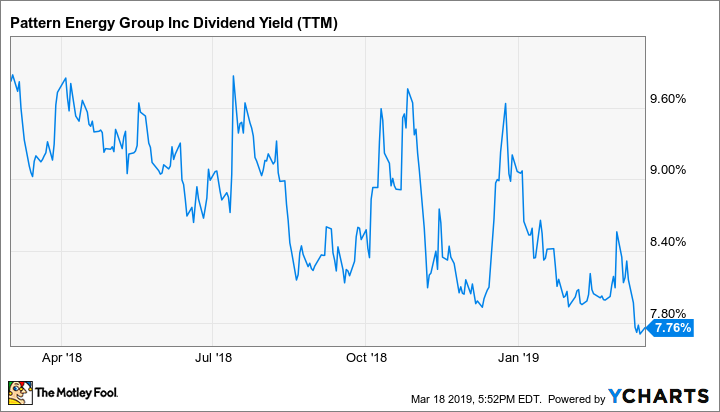 But at the same time, there's plenty of reason to view it as a potential dividend trap, since the company paid out essentially all of its cash flow last year to cover said dividend. However, management gave investors a two-year outlook on its fourth-quarter earnings call, laying out a plan to grow cash flows by 2020 that would cut the payout ratio to a far-safer 80%. Considering it did grow cash available for distribution -- or CAFD, a key cash flow metric for yieldcos -- by 14% last year, the company is clearly on an improved track. But it's a lot easier to explain a plan for cash flow growth than pull it off, and if the company struggles to deliver on that plan, it doesn't have much (or, really, any) wiggle room. Let's take a deeper look at Pattern's cash flows, its plan, and the chances that management can succeed. Pattern Energy's first quarterly dividend was $0.31, which it paid in January 2014. It would pay that same amount three months later, but when it made its third-ever dividend payment, Pattern started an impressive record of raising the payout every quarter for the next three and a half years. That streak of 15 straight quarterly payout raises came to an end in April 2018, when management decided to keep the payout at $0.42 per share, the amount it has paid for five straight quarters and says it will pay again this coming April. So why did the dividend growth streak come to an end? In short, a confluence of events were putting a squeeze on Pattern's ability to grow cash flows. First, rising interest rates and changes to the federal tax code have had the combined effect of pushing up Pattern's cost of capital, while also shrinking the pool of potential minority investors to help develop new wind and solar projects. And, of course, the double whammy of those two things caused no small amount of stock selling in late 2017 and early 2018, pushing the dividend yield consistently over 8% (and often above 9%) for much of that time. PEGI dividend yield (TTM) data by YCharts. When your stock yields over 8%, it's impossible to get much of a return by selling stock to fund growth projects. Combined with rising rates, a shrinking pool of potential tax equity investors, and a dividend that already consumed all its cash flows, and the general bear thesis is that something would have to give, and the dividend was the most likely thing. As was discussed above, Pattern did manage to grow its cash flows enough during 2018 to just barely cover its dividend obligations. Pretty impressive for a company that had -- or at least it was perceived to be -- very limited capital and few options to get more. However, management took a savvy approach to improve cash flows and boost returns in 2018, selling off stakes in two wind farms for, as CEO Mike Garland described it, "... multiples that provide us opportunity to make accretive new investments." And they did make new investments with those proceeds, acquiring 315 megawatts of new wind and solar production and paying lower cash flow multiples for those new assets than the premiums they commanded from the asset sales. The result was $6 million in incremental cash from new investments, helping offset a $5 million reduction from retained assets. Pattern improved its operating results on the expense side as well. Garland said the company came in $12 million under budget on operating expense in 2018, more than offsetting the $5 million reduction in cash from existing operations due to weak wind in some geographies. Pattern's ability to grow CAFD over the next two years is absolutely critical to its ability to both maintain the current payout and return to dividend growth. Management's goal is to grow CAFD from $167 million in 2018 to $175 million in 2019 and $205 million in 2020. The bulk of 2019's projected increase is already baked into Pattern's assets. The company expects to generate $16 million at the midpoint of its guidance in new cash flow from its existing asset base. This big increase is the product of both last year's new investments, which will generate a full year of incremental cash flow, as well as improved operations coming out of a weak 2018. The company also expects to capture about $5 million in cash flow from other new investments it will make over the course of 2019. This $21 million in incremental cash flow will be offset by $11 million in reductions from assets sold off in 2018, the impact of hedges on its Gulf Wind facility. So there's a pretty straight line to generate $175 million in 2019 that doesn't require substantial asset flipping or closing a bunch of new deals. Looking at 2020, things get a little more reliant on new investments. There's good news on that front, however, as the first cash flows from Pattern Development (a privately held project development partnership of which Pattern Energy owns 29%) will start to roll in during 2020. Image source: Pattern Energy presentation. The company expects Pattern Development to pay it $17 million in distributions in 2020, which when added on top of the new $175 million baseline from 2019 (minus $2 million in expected losses from hedges) gets us to $190 million. Getting to the $205 million CAFD figure would require an additional $15 million in cash flow from new investments. So how can Pattern Energy get there? Its relationship with Pattern Development is expected to be a big part of this. The company has initial right of first offer (iROFO) on five projects in 2019 and 2020, worth almost 485 MW of capacity. Finding deals is one thing; paying for them is the key. The company reported $735 million in total liquidity at year-end, with $200 million of that available for acquisitions and investments, much of which will be utilized on the already-identified dropdowns. Furthermore, if the company meets its guidance for CAFD growth in 2019, it would have even more liquidity once 2020 rolls around. However, none of that will be enough. Pattern will have to expand its liquidity, do more asset rotation deals to come up with capital, or (most likely) some combination of both. While management won't disclose any assets it may be targeting to sell, it did tell us it plans to expand access to capital by $300 million to $500 million, with a combination of corporate- and project-level leverage, joint ventures, and other equity and partner capital options. On one hand, Pattern's ability to get to its 80% payout ratio goal has a lot of moving parts, and certainly requires access to capital that it doesn't have today. However, its 2019 goals are very attainable. It would require closing a few dropdown acquisitions it largely already has the liquidity to fund, but mostly just capturing a full year of cash flows from last year's acquisitions. Yet achieving those objectives would mean increased financial strength. That would improve Pattern's access to capital heading into 2020, making it easier for management to make the new investments necessary to reach $205 million in CAFD. If you're looking for a dividend that's more secure today, there are other yieldcos that already have a better margin of safety but at much lower yields. If you're willing to take on the risk of a payout cut if things go awry, though, Pattern's 7.7% yield and the potential for share price appreciation as cash flows ramp up, look well worth it to this investor.